Data is the lifeblood of the information society. Any time a consumer uses a smartphone, a social media platform, the computing cloud, or any other new technology device, the odds are the consumer is entering personal identification information (PII). This personal information can include a person’s phone number, physical address, email address, bank account number, credit card number, itinerary, family information, work information, social security information, driver’s license information, and a host of other information. Any or all of this information can be used by criminals against the consumer and by companies who are targeting consumers. At Paulson & Nace, PLLC, a family-owned and operated firm, our West Virginia privacy protection lawyers explain what happens when a consumer’s personal information is breached. We investigate the cause of the data breach and the way the data can be used against the consumer. Our lawyers help consumers file proper consumer complaints, and we file lawsuits to hold negligent and intentional data breach hackers and violators accountable. Consumers expect that information they provide online will be secure. Consumers want their information disclosed only to the people or companies they deal with directly. But hackers and thieves want to get as much personal information as they can to steal assets and accounts of consumers. Data theft is one of the newest types of crimes that criminals are using to gain PII. Cyber-attacks are escalating. Pursuing local claims when companies with notice of data breaches fail to notify their customers of known breaches. Filing class action lawsuits against companies that knowingly or negligently allow data breaches to exist or continue. Appropriate prosecutorial agencies may also bring about criminal actions against wrongdoers. Our attorneys also recommend checking credit reports on a regular basis. Consumers can get a free yearly credit report. Our Paulson & Nace West Virginia privacy protection lawyers help clients review their report for information that is inaccurate, outdated, or wrong. Additionally, use additional credit and data protection sources recommended by the Federal Trade Commission. 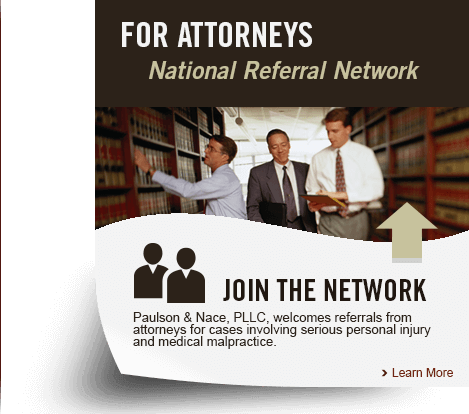 Paulson & Nace lawyers know the Computer Fraud and Abuse Act, the Stored Communications Act, and other laws that are designed to protect consumers from data breaches of their PII. We investigate claims and file lawsuits against violators when warranted. If your data was breached or you think there has been a violation of your privacy, please call Paulson & Nace, PLLC for a free discussion with a knowledgeable consumer protection lawyer. Our family of consumer protection lawyers explain consumer rights in this highly technical age and how consumers can best protect themselves from data breaches. We also explain when lawsuits are a proper remedy. You can reach us at our West Virginia office by calling 304-741-8079 or filling out our online contact form. Our office is located at 3501 Maccorkle Ave SE, Charleston, WV 25304. $1.75 million verdict in a medical malpractice case. $3 million verdict for paralysis due to failure to diagnose an epidural abscess. Wrongful death following bypass surgery. The case liberalized malpractice law in Virginia. Wrongful death of West Virginia man for improper treatment of pancreatitis.